Saving weight is currently a huge challenge for the aerospace industry. 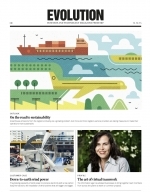 Enhancing performance or achieving lower emissions can offer manufacturers major advantages in a competitive market. The use of composite materials offers opportunities in all these areas. When it comes to interface parts, saving weight by shifting to a composite is a challenge because of out-of-plane loading. To avoid increasing costs, function integration is a necessity. SKF Solutions helps to achieve these goals, thanks to two major futuristic technologies – SKF Black Design and SKF bearing integration. 1. SKF Black Design is the capability of making high-performance, out-of-plane loaded parts from fibre-reinforced materials. Once the way of using the composite technology for an interface part is fully accomplished, it will open up a new field of opportunity, brought about by composite technology through function integration of such a bearing. 2 . 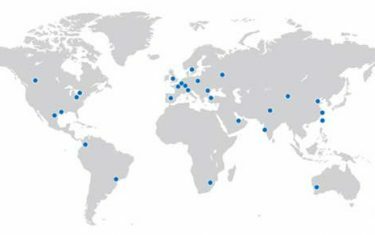 SKF bearing integration efficiently embeds a bearing into a composite part, by providing a strong interface to the outer ring of a rolling bearing or integrating a spherical plain bearing into a composite housing. This technology provides the capability to design and build parts for structural interfaces in a composite material. Within the aircraft industry, the use of composite materials has soared, yet traditional design techniques provide only limited improvements in their structural performance. This has restricted the applications that composite solutions could be applied to. 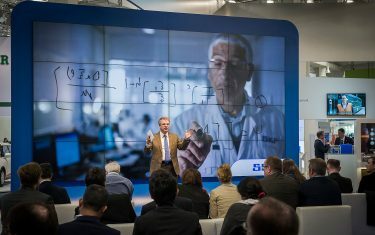 SKF has succeeded in meeting the technical challenge of turning metal structural interface parts into lightweight and high-performing composite parts. The result of years of research and development is called SKF Black Design. SKF achieved this exceptional result by changing the paradigm of composite-part engineering. Deploying conventional part designs in composite rather than metal (“Black Metal” approach) yields only modest improvements in performance, and the parts remain prone to unfolding and delamination. However, in SKF Black Design, the matrix (resin) material is used where it performs best: in compression. To make this happen, SKF engineers developed new forms, shapes and part geometries, designed to make sure that in areas subject to out-of-plane loading, the resin remains in compression through the laminate thickness. This leads to higher shear stress resistance and eliminates the unfolding effect. The use of hemispherical washers to avoid any tendency to punch through and, in addition, provide compression in the composite, is an example of a clever solution that is proven to significantly increase the strength of the part. The designs also incorporate sophisticated corrugations and the carefully balanced use of bulk and continuous reinforcing materials – all knowledge that the SKF Composite Centre uses to help its partners. The goal of weight saving in aircraft is to reduce both fuel consumption and the impact on the environment. This has led to a 50 % increase in the use of composite materials in the latest generation of commercial aircraft. Increased use of composite materials in aircraft, however, is limited by the structural performance obtained with the traditional design of composite parts. SKF Black Design provides the structural performance required by combining the use of existing carbon-fibre-reinforced polymer (CFRP) materials with innovative design techniques. SKF Black Design extends the scope of application of composite solutions to structural parts with a competitive mass-versus-cost ratio, compared with the current metallic solutions. The composite materials most commonly used in the aerospace industry are made by stacking pre-impregnated plies of carbon fibre. The resin enables transmission of the load between fibres and ensures the cohesion between the plies. This technology fits well with fuselage, wing, frame and stringers as the laminate is primarily subjected to in-plane loads. For these geometries, the carbon fibres provide high strength and stiffness in the orientation of the fibres; however, in the direction normal to the plane of the fibres, the mechanical properties of the material are dominated by the resin. The resin is the bonding agent and has a poor strength compared with carbon fibre (about 50 times less). 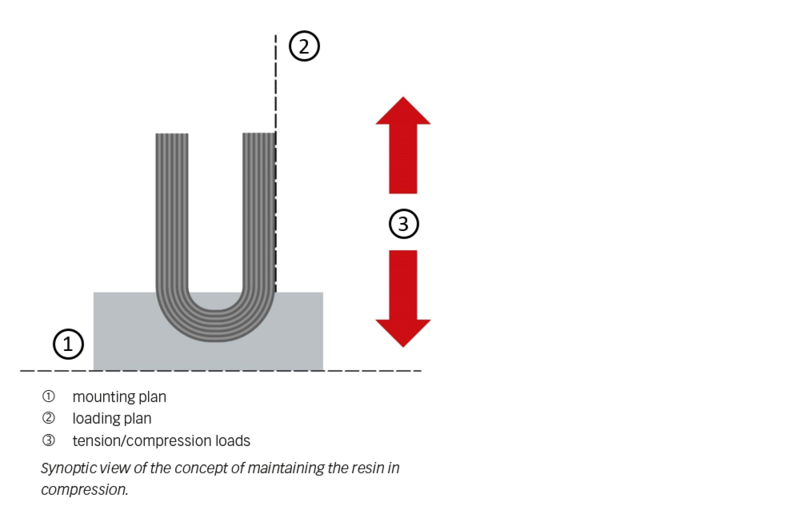 Therefore, use of composite materials is limited for structural parts with out-of-plane loading, such as structural interface parts such as T-shaped fittings and cleats (fig. 1). With traditional geometry, metallic fittings and cleats are subjected to folding/unfolding phenomena. 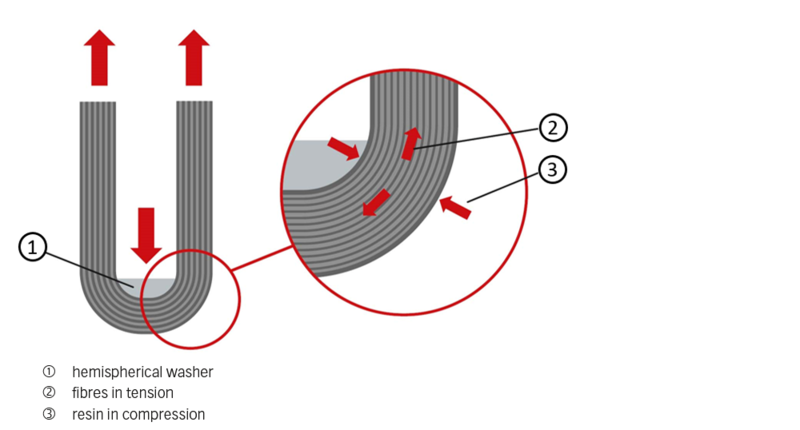 In composite fittings of the same shape, the same loading pattern leads to the separation of the CFRP plies in the 90° corner due to interlaminar stresses in the resin. This phenomenon is called delamination and occurs at a very low level of loading, which results in a non-feasible part. Fig. 1: Out-of-plane loading, example. The composites industry has investigated new technologies, such as 3D weaving and high-performance resins, in combination with traditional part geometry (“Black Metal” approach) to solve this issue. This approach, however, has shown significant limitations in terms of mechanical performance and cost competitiveness. SKF Black Design is based on concepts that solve the challenge of out-of-plane loading by adapting the geometry of the part. The first concept consists of designing the part geometry and ply layup to maintain the resin in compression when the part is loaded in its application. The resin withstands far more stress in compression than in tension, and compression also improves the resin’s shear stress capability. This design philosophy has commonly been used for structures throughout civil engineering history, such as arches and bridges, where the design has required keeping the structural components in compression. Fig. 2 shows how weak the resin is in tension and the effect of compression on the shear stress capability of the resin. Fig. 2: Resin stress diagram. SKF has implemented this concept on structural fittings by designing hemispherical washers combined with a carbon-fibre sole. This specific design naturally compresses the resin in the out-of-plane loading area (fig. 3). Moreover, the more the load in the part increases, the more the compression proportionally increases locally, which helps solve the issue of delamination in the 90° corner. Fig. 3: Hemispherical washer combined with a carbon-fibre sole. Under tension (fig. 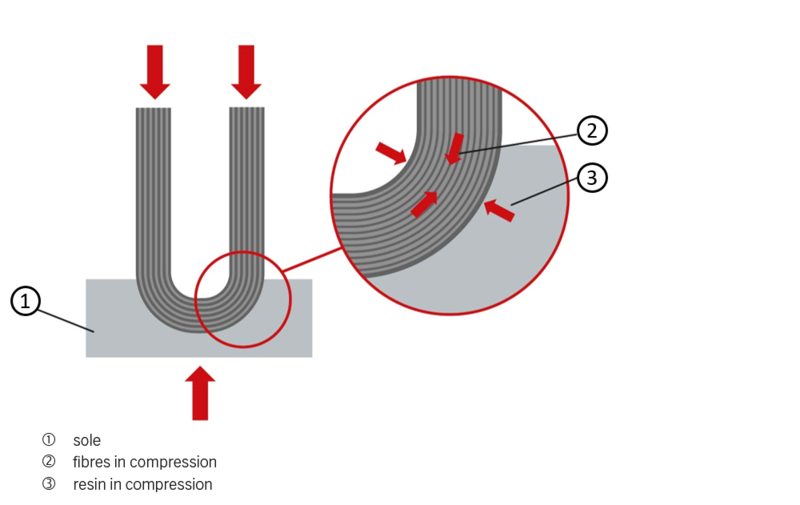 4), the hemispheric washer locally applies compressive stress on the CFRP material, which keeps the resin in compression. Fig. 4: Fitting under tension. Under compression (fig. 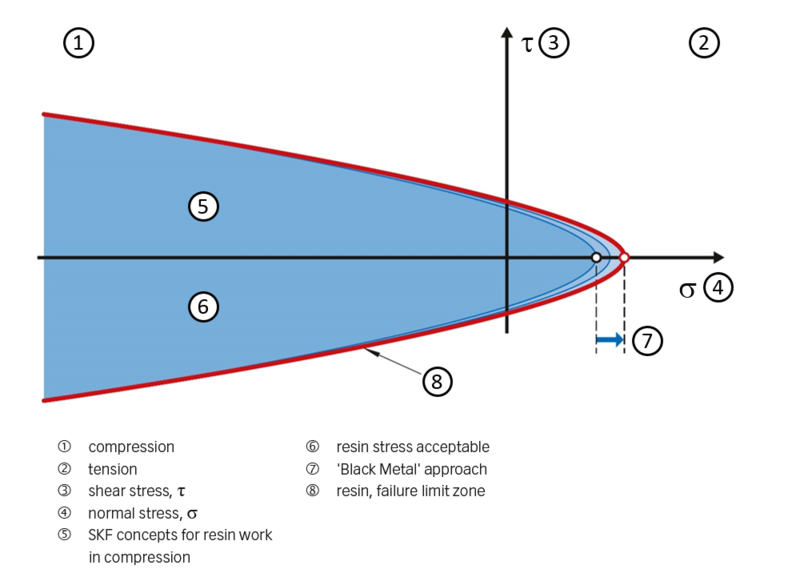 5), the sole acts as a clamping shape to locally compress the CFRP material. The sole allows for the geometry of the base of the fitting to be tailored to the size and mounting requirements of the application. Therefore, hemispheric washers and the fitting sole work together to maintain the resin in compression under both tensile and compressive stresses applied perpendicular to the mounting plane (i.e., out-of-plane loading). Failure of the fitting is not driven by mechanical properties of the resin; consequently, the SKF Black Design fitting enables increased mechanical performance for a given geometry and weight. Fig. 5: Fitting under compression. The second concept of SKF Black Design consists of the use of specific shapes to bring mechanical stability and stiffness to the fitting. Rounded shapes allow for the prevention of relatively sharp 90° corners, such as those found in metallic fittings. Rounded shapes align the carbon fibres in the appropriate direction to postpone unfolding phenomena and bring mechanical stability and stiffness to the fitting. This concept can be advantageously used for cleats (fig. 6). Fig. 6: Metallic cleat versus SKF Black Design. In addition, the SKF Black Design concepts can be combined in a single interface part; for instance, the concept of maintaining the resin in compression as well as specific stiffening shapes can both be applied to the design of a T-shape fitting as shown in fig. 7. 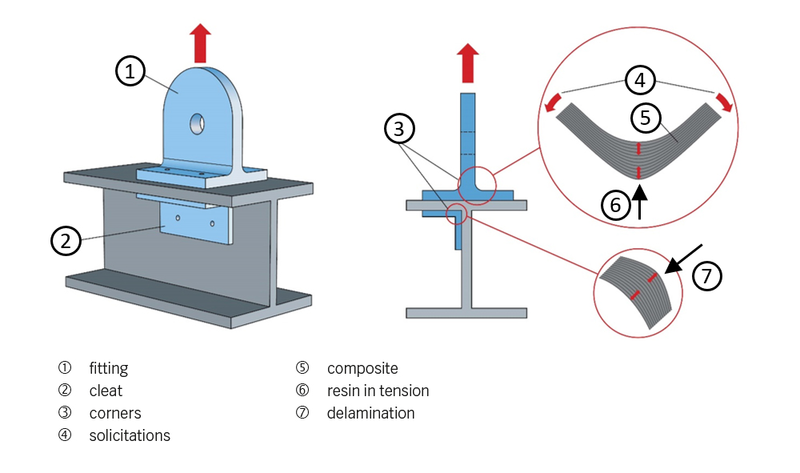 To validate these concepts, tests were carried out on subscale and full-scale cleats and fittings on tensile and compression test benches as shown in fig. 8. Fig. 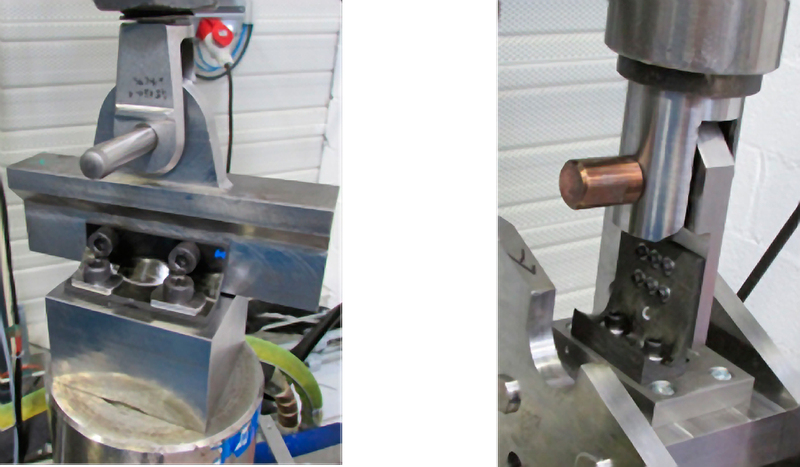 8: Tensile/compression test benches – cleat (left) and cleat based on SKF Black Design (right). Development of these concepts has resulted in the study and validation of different composite structural interface fittings. The results have been compared to equivalent metallic structural fittings, and composite solutions made with SKF Black Design demonstrate weight savings of more than 40 % when compared with metallic parts with the same mechanical performance. SKF Black Design enables the conception and manufacturing of lightweight, high-performance structural interface parts specifically designed for applications to support out-of-plane loading and made out of CFRP materials. SKF is in the process of developing mechanical models and numerical simulation tools that will enable general design and analysis of composite structural fittings for the aerospace industry. This SKF technology has the capability of integrating bearings directly into composite structural parts. For SKF, as a world leader in the design and manufacture of rolling and plain bearings, this is a very natural development of SKF’s abilities to produce interface parts in composite materials. SKF is developing interface solutions to create an embedded joint in the composite part. Depending on the application requirements, this joint can either be a ball bearing, a plain bearing or a spherical plain bearing. 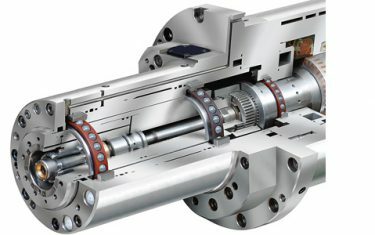 a high-strength integration of a rolling bearing into a composite structure with proprietary solutions to create a reliable interface, suited for wide temperature ranges, heavy loads and high speeds. the direct sliding contact of an inner ring against a composite surface, primarily for spherical plain bearings, for a solution providing high performance in terms of wear, friction and reliability. These technologies are breakthrough and disruptive: They provide obvious weight-saving opportunities in the in-service environment but also the integration of the joints, as an in-mould operation eliminates the post-moulding steps and streamlines the manufacturing process. When it comes to weight saving, extending the use of high-performance composite materials can frequently hit cost barriers. This is particularly true when the change is managed at the discrete component level. 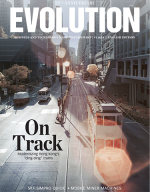 To counter this effect, consolidation of systems is now widely acknowledged as a solution. This leads to an obvious initial cost reduction, due to the removal of assembly steps and the combining of manufacturing times. But this approach also soon encounters limits if it is not pushed to a higher level. Restricting the consolidation to bringing together all the components and retaining the same level of performance, component to component, often leads to an underutilization of the potential of composites, material wastage and unnecessarily high cost. A more powerful approach takes into account all aspects of their individual performance, costs, process and opportunities. Taking the example of stiffness, achieving the required stiffness component by component might require extensive use of carbon fibres in some components, whilst in others the use of glass fibres would be sufficient. This would result in higher material costs, or it might even make the integration impractical. If, however, the system stiffness function is redistributed, a distribution could be identified that matches system performance but at lower cost. This approach can combine requirements for multiple functions such as stiffness, mass and damping into an optimized design. This is what the SKF Black Design function integration offers: composite-oriented function integration for best system performance.